MAXVY's provides configurable GDDR6 verification IP. GDDR6 is Graphics Double Data Rate 6 (GDDR6) which are defined for high-speed interface to access Synchronous Graphics Random Access Memory (SGRAM). 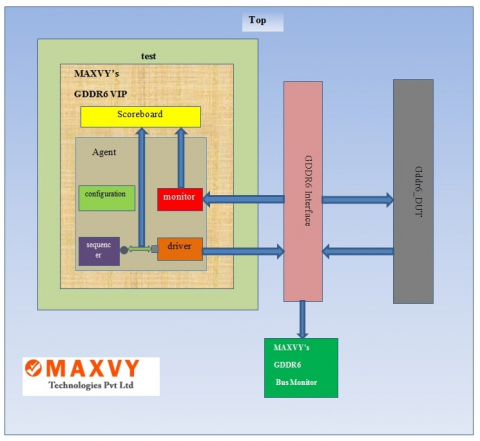 MAXVY's VIP provides more flexible configuration for user to select their needs like channel selection, device configuration, write latency, read latency, DDR, QDR data transfer mode. Fully compliance with JEDEC Specification JESD250A. Support DQ data rate up to 12 Gbps per pin. Support Low powe mode features. Support Auto refresh and self refresh. Support x16/x8 mode, Pseudo-channel mode configuration. Support Data bus inversion (DBI) Command and Address bus inversion(CABI). Support Single/Double byte Write Data Mask function. Support Data read and write training. Support Application specific Processor interface (user specific). Configurable Option like DDR,QDR data transfer mode, write latency, read latency. Supports AXI bus transaction sequence for data byte transfer. Simple steps to integrate into customer environment. Encrypted Source Code of VIP.